South Africa is a country of great contrasts. It is a land of seemingly endless beauty, yet its people endured one of the great struggles of our time when they overcame Apartheid. In February, during one of the best times of year to visit South Africa, spend two days on escorted game drives where we hope to see Africa’s Big 5—elephants, lions, Cape buffaloes, leopards, and rhinos—at the Amakhala Game Reserve. 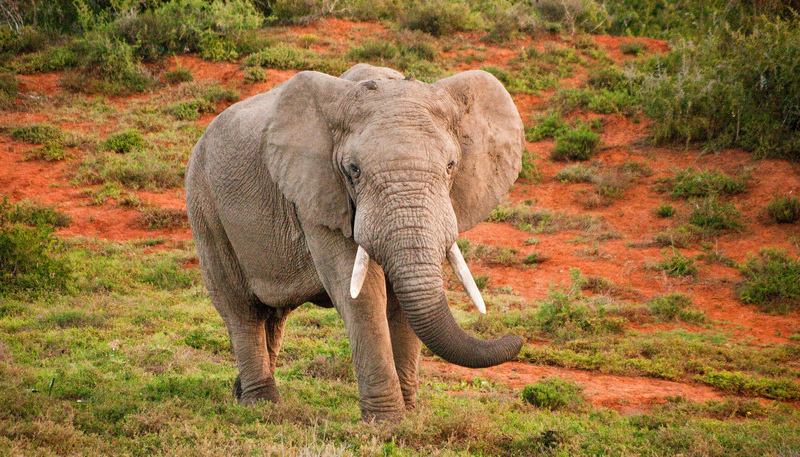 At Addo Elephant National Park, have another chance to see the Big 5, plus whales, and learn about animal conservation. Drive along South Africa’s scenic Garden Route, a coastal corridor along the southern coast lined by ancient forests, rivers, wetlands, dunes, stretches of beach, lakes, and mountain scenery. Then spend seven days travelling in and around Cape Town. Tour Robben Island where Nelson Mandela was imprisoned. See one of Africa’s only two remaining colonies of penguins at Cape of Good Hope. Enjoy a cable car trip up Table Mountain and a visit to Kirstenbosch botanical gardens. Experienced (and fun) tour leaders Len and Mary Friesen have led several groups to South Africa over the years. READ a blog post by Len and Mary Friesen about why South Africa is on the top of travellers’ bucket lists and why a TourMagination tour is especially special. Arrive in South Africa at the Port Elizabeth airport, and transfer to the Amakhala Game Reserve in the Addo region. Get acquainted with your fellow travellers. The Addo region is perhaps the top region in the whole of the southern Cape for seeing big African game. Spend two entire days on fully escorted game drives, and stay in a highly regarded safari lodge. Though nothing is guaranteed, you should expect to see most if not all of Africa’s “Big 5”: elephant, Cape buffalo, rhino, lion, and leopard. There is nothing like the charge you get when you first see them. Your experienced guides at the Amakhala Game Reserve will also show you the wealth of flora and fauna all around you. As for relaxation, think pools and a full-service wellness centre. Imagine evening conversations by firelight and night skies that explode with stars. Visit Addo Elephant National Park on your final day in the Eastern Cape. Addo is one of South Africa’s newest National Parks. It is growing constantly and boasts Africa’s “Big 6”—the Big 5 plus whales. During a morning game drive, learn about animal conservation and natural regeneration. Stop at the historic village of Uitenhage, before continuing to Mossel Bay. This is no ordinary stopover. This small harbour town is mid-point on South Africa’s scenic coastal “Garden Route”. Mossel Bay was the very first place where Europeans set foot in southern Africa. Learn about the first Portuguese sailors and settlement, and perhaps visit a replica of the actual ship that was used by the Europeans on their great oceanic voyages. Consider as well the initial points of contact between those first Portuguese and the indigenous peoples of the Cape region, including the San and the Khoisan peoples. Or wander the shoreline, dip your feet in the Indian Ocean and consider how your geographic reference points here are Australia and India, not North America! Travel at a relaxed pace to Cape Town, South Africa’s Mother City. Enjoy the drive along the scenic Garden Route, a coastal corridor along the southern coast where ancient forests, rivers, wetlands, dunes, stretches of beach, lakes, mountain scenery and indigenous fynbos all merge to form a landscape of restorative beauty. When you reach Cape Town, you’ll unpack for almost a week, during which you will experience something new every day. The hotel is ideally situated to explore the city safely on foot, which you will do, especially for many of the group’s evening meals. It is also a good place to learn about the region’s history with special emphasis on the time of white settlement and the struggle to end apartheid. Surprisingly, there is a large, old, and thriving Islamic population located not far from your hotel. It won’t take long to see how cosmopolitan this city really is. Take the cable car up to the top of Table Mountain for unforgettable views over the city and peninsula. Learn why the Dutch first settled here and who was here before they showed up. Learn about the British conquest of southern Africa and why it mattered to them. Or just gaze at the unbelievable views! In the afternoon, travel a short distance to Kirstenbosch Botanical Gardens, a stunning paradise that is a UNESCO World Heritage Site. Learn why, marvel, and be amazed. Wander along paths and over suspended bridges. Buy quality souvenirs made in community-based projects that improve the daily lives of ordinary South Africans. Get up close and personal with the Cape of Good Hope, which is right beside Cape Point. It really does feel like you’re standing at the bottom of Africa. Ride the funicular to the top of Cape Point and stare out into the distance—next stop, Antarctica. Today, we’ll also take the Chapman’s Peak Drive, considered one of the engineering marvels of Africa and one of the continent’s great cliff-hugging drives. Have a late lunch in Simon’s Town and learn about its important history. Expect to see baboons today and maybe the great eland (an antelope) and even perhaps whales in this natural wonderland. Confront the story of South Africa’s Apartheid years with a visit to the former prison of Robben Island, about 5 miles off the shores of Cape Town. Tour the place where Nelson Mandela was confined for more than a decade, with a guide who will likely be a former prisoner there. It’s no surprise that this island is also a UNESCO World Heritage Site. Return to the refurbished Victoria & Alfred Waterfront for lunch. Then enjoy free time in the afternoon, which can be down time or one of many options that your tour leaders Len and Mary will give you. Or you can hang out with the Friesens doing whatever interests most people in the group. Head out of Cape Town to Betty’s Bay to see one of the two remaining colonies of penguins in South Africa. Learn about their sensitivity to climate change and marvel at the natural setting as you drive up the coast. This is also a good day for whale watching. Then head inland to the winelands. Tour a winery, learn about the history of this region and even its connection to Mennonites, and have lunch at one of its historic sites. A definite highlight this afternoon will be the opportunity to stroll in the heart of historic Stellenbosch. Stop at Cape Town’s Signal Hill on our drive back into the city for perhaps the best views of Table Mountain. This will be your last full day in this extraordinary city and the sky’s the limit in terms of options. You can return to one of the sites visited previously, go souvenir hunting, or wander about the heart of Cape Town. We may even visit St. George’s Anglican Church, where Desmond Tutu proclaimed a worldwide challenge to Apartheid. You could also go on a township tour, a fascinating insight into South Africa which takes you on a journey through history by following a timeline that starts in 1652 and makes its way to present day Democratic South Africa. The township tour will include visits to Bo Kaap, the District Six Museum, and the townships of Langa. At a farewell dinner together on the city’s central Long Street, expect live music as our group gathers one more time, by now more a community of travellers than a group of strangers. Depart for home full of rich encounters and conversations. If you wish to stay on in South Africa, Len and Mary will be happy to make suggestions in advance of places to visit.